Blogging marathon kicks off a month long feat of bringing the best of 28 states and a couple of union territories. The first state is a neighbour. Andhra Pradesh for me is predominantly Hyderabad where I spent a few months in 1999/2000. Andhra also shares border with maharashtra which means there is a lot of influence on the culture both ways. This state forms part of the 4 major states from south India. It still stands out distinctively in terms of food from other states with the influence of moghul culture which enjoyed its rule for the longest period. Even the bylanes of hyderabad and secunderabad have the traces of the glorious past albeit most of it in shambles now. But if you appreciate cultural influence you will enjoy a trip to the nizam's den. And once there you need to taste a few things without fail, Tamarind Rice , Puliyogare rice, Pesarattu and the Hyderabadi Biryani. And when you speak about biryani the most popular accompaniment to go along with it is the Mirchi ka Salan. A deliciously flavored spicy and tangy gravy preparation that compliments the biryani perfectly. 3) In a pan heat oil. 6) Add the sliced onions to the hot oil. 9) Add the garam masala and salt and some water to make curry like consistency. 12) Serve hot alongside biryani or roti , topped with the green chillies. 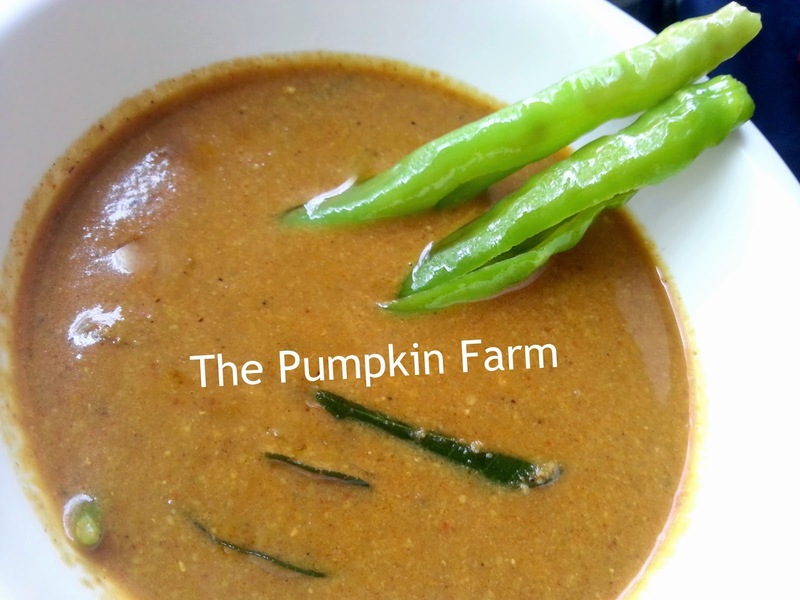 Another mirchi ka salan recipe ! Love it with biryani. You are right about neighboring states having influence on the cuisine. Even I noticed how some the food is similar to Maharashtrian cuisine. Very nice Pradnya, for a person who started late, you really rocked!..lovely post..
that is so delicious and finger licking good!!! This is one of the most cooked and trademark dish of Hyderabadi cuisine, trust me i also planned to make them for this Mega marathon, u guys are tempting me now. Same pinch ! I love this Hyderabadi delicacy and yours looks fabulous ! Sesame, coconut and peanuts plays a great role in many of the hyderabadi dishes i believe, i was a bit hesitant to try this, thinking would be very spicy!!! Looks very tempting!! what a great combination of peanut and coconut! It looks really yum, Pradnya...I am just closing my eyes and thinking of the flavour bursts there in that salan....yumm! My husband's favorite gravy! Tastes awesome with Biryani/Pulao. Very flavorful & delicious dish.. The salan looks great. Enjoyed reading what you took back from you stay there. Lovely choice. I love this spicy salan a lot. Its Hydrabadi. Looking forward to see more here. Love that spicy and yummy Hyderabadi mirchi ka salan. Looking forward to your posts this month. Another mirchi ka salan,looks so tempting and flavorful.. Perfect combo with briyani.. Very tempting dear.. I love this gravy so much. One of the best dishes from this state.